In light of my book, Sustainable Home, being published today (woohoo!! ), I thought I would kick off the occasion with a beautiful home tour and interview with Tim from Bay on a Budget, also Christian musician from Tim Be Told. Tim has a unique perspective as he has a background in architecture combined with musical creativity, a keen eye for design, and 'just-build-it' mentality. 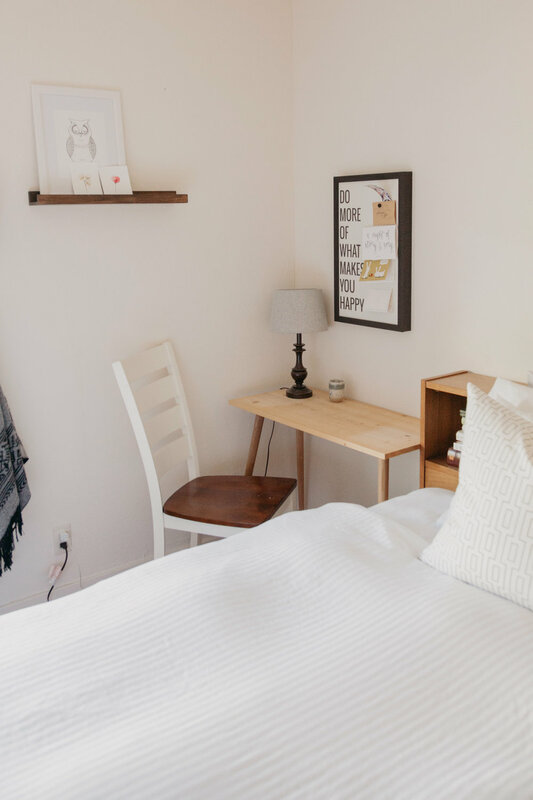 He recently went through a remodeling project of his home which he shares on his blog, and I went to his newly renovated home to ask him about the process, his insight on design, and how he keeps things simple and intentional in his home. As mentioned in my book, "Your home is a sacred space...it is within our homes that we build our livelihoods, establish our daily routines, and spend time with loved ones. 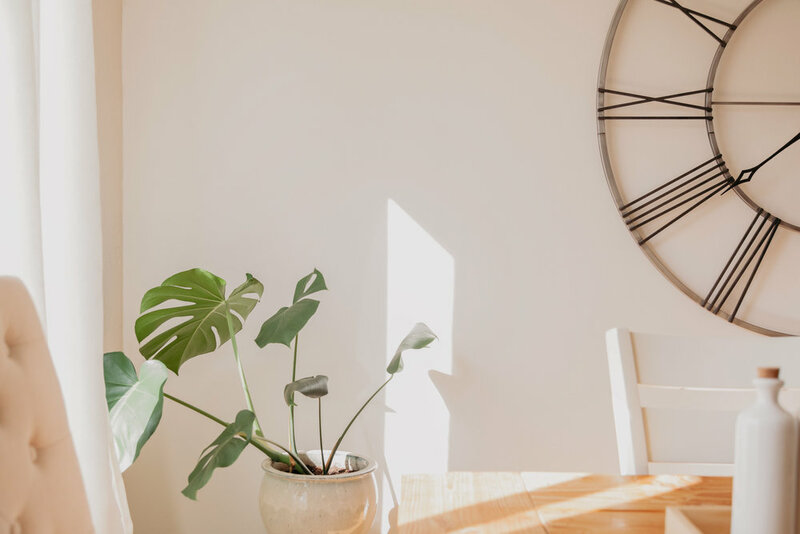 It's likely that your home is the place you will spend most of your life, even if you 'home' moves from place to place [thus making our] home routines prime opportunities for sustainable change." Tim is quite the builder when it comes to creating furniture, and employs a few principles in his home that help to simplify his life. I thought I would share some of his insights and stories in the video below, otherwise feel free to browse his blog, or keep reading on some quick tips from Tim. When it comes to curating furniture and home good, Tim thinks about a few things: he opts for classic, neutral colors to make his pieces stand over the test of time, as well as natural, durable materials. Whether it's using solid wood over MDF, or glass over plastic in the kitchen, Tim looks for quality materials that aren't harmful for our health or the environment. These things can often last much longer as well. Regarding furniture, he's built his coffee table, open shelving, dining table and bench, and more. He's also been able to upcycle quite a few pieces, giving them a bit of a makeover to make them match the rest of his home -- my personal favorite is how lucky he was when he scored the perfect sized boards for his open shelf system in the kitchen. Tim also has two main principles he likes to keep in mind to keep things meaningful and simple in his home. 1. Treat each object with care. Each thing in your home should have some sort of meaning of value. One great tip that Tim shares is how he likes to take a picture of specific rooms in his home which he may want to furnish, and when he goes into the store, he will compare the picture with an item he may want to purchase. Does it match the home? Will it bring purpose and meaning? Using this tactic can help to reduce clutter. Another great tip Tim mentioned (not in the video) is that when buying toys for kids, buy things that are multi-functional. For example, blocks are great because they are versatile and can be used in a multitude of ways that allow children to express creativity when playing. Tim installed his own open shelving in the kitchen and living room, but also uses shelving in both bedrooms and the bathroom. This allows him to keep a meaningful, visible inventory of what he has in his home, and each item not only serves a function, but also brings beauty and personality to his home. Whether it's a photo, a book, or some sort of collectible over time, Tim appreciates how everything he has curated in his home that is placed on the shelving has some purpose and sentimental value.